Nonstick cookware to spark your kitchen decor! 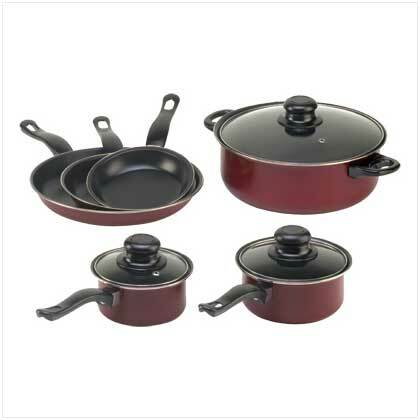 Cooking can be enjoyable with this burgundy Carbon Steel 9-Piece Cookware Set by Malibu Creations. Try these non stick pots and pans and a set of non stick skillets to help you prepare tasty dishes for family and friends. Carbon steel pans Are tough and durable. Non stick coating Provides easy cooking and pouring from the pans, and quick clean-up. Insulated handles Are heat resistant for safer handling. Hand wash For longer lasting non stick pans. Rich, burgundy finish Adds an attractive look to kitchen decor.